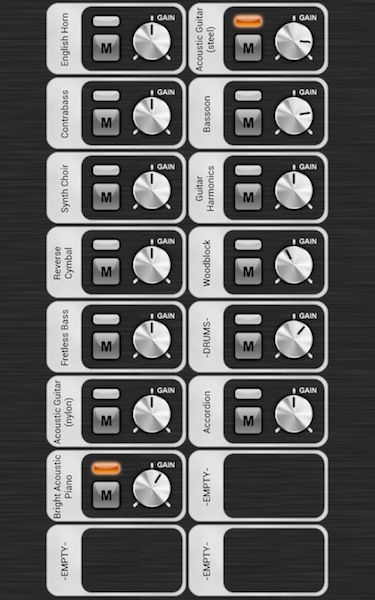 LiveMIDI mixer allows you to customize the sound of the currently playing song. You may increase or decrease the channel's volume, muting the channel, or setting one or more channels to play in solo. To open the mixer view, tap on the "Mixer" icon on the lower right of the playlist view. 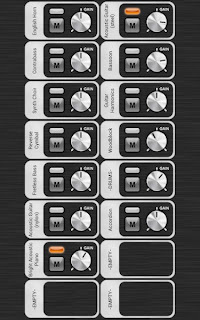 The mixer view displays 16 MIDI instrument channel in order, from left to right and top to bottom. Each used slot will display a note on/off indicator, mute/solo status and button, as well as volume knob to control the volume of each of the instrument assigned on the channel. To mute a particular channel, tap the "M" mute button. To set one or more channels to play in solo, double-tap the "M" mute button. All mixer settings will be automatically saved for the song, and reloaded each time the song is played. Continue to the Remote Control section on how to control LiveMIDI remotely.